It’s been a busy few months at Avid Design Group with the recent launch of six new websites for both existing and new clients of our agency. Here at Avid Design Group, we provide affordable, professional, custom designed and WordPress programmed websites, website hosting and marketing, logo/brand development and a complete spectrum of print design services, social media consulting and management, and marketing strategies and plan development services. 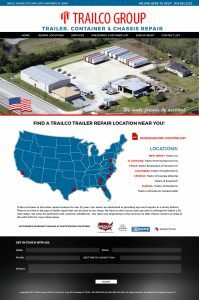 Located in the beautiful St. Augustine, FL area, we are celebrating our 18th year of providing business to various size company’s throughout a variety of industries, both local and out of area. 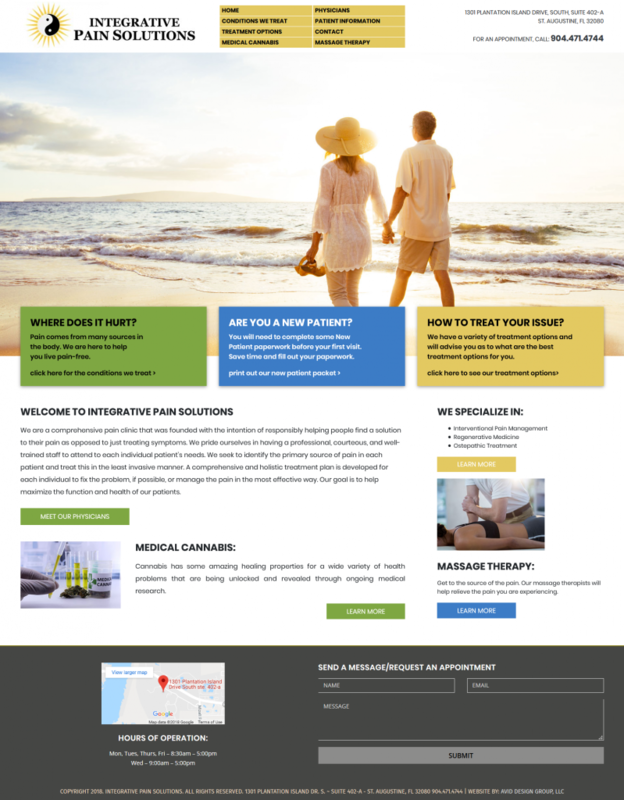 Four of our existing clients and friends looked to Avid Design Group to provide them with a new, modern designed and programmed site to further expand their marketing presence on the Web. 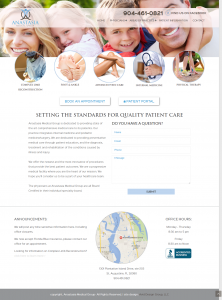 Anastasia Design Group, Flagler Family Medicine, Putnam Heart Center and Designs of the Interior (DOTI) all have a new modern custom designed, WordPress programmed website that helps their business to stand out among their competition. We are happy to announce that two new companies selected Avid Design Group to design and develop an entirely new website for their business to further expand their presence on the Web. 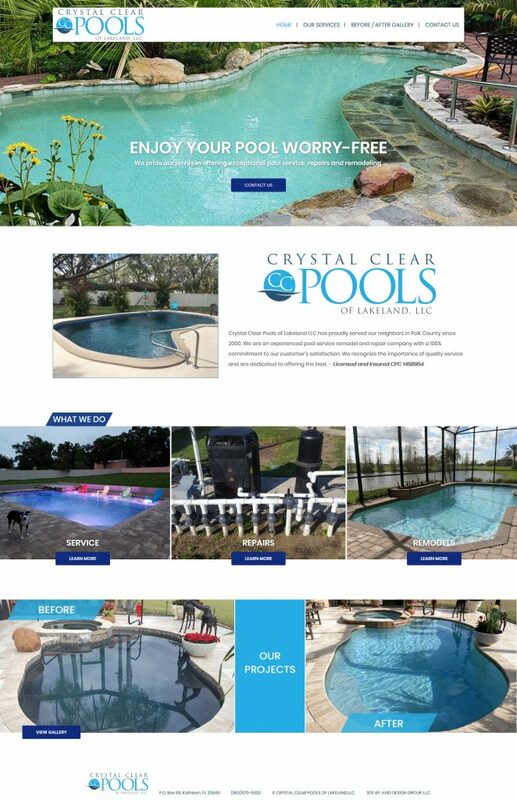 We are happy to have Crystal Clear Pools of Lakeland, LLC and Steve Chapman’s All American Air as part of our family of clients. 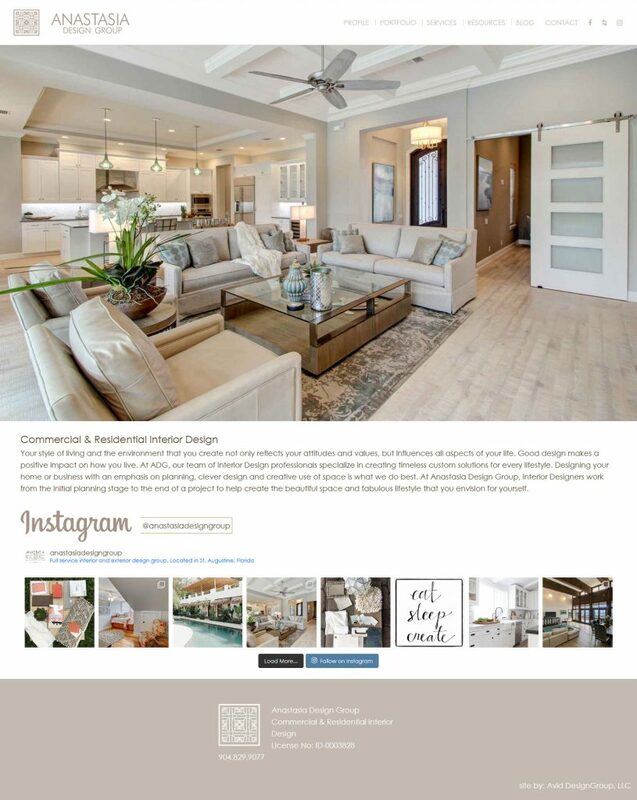 Here at Avid Design Group, we would like to announce the launch of two new website projects that have recently been completed by our agency. 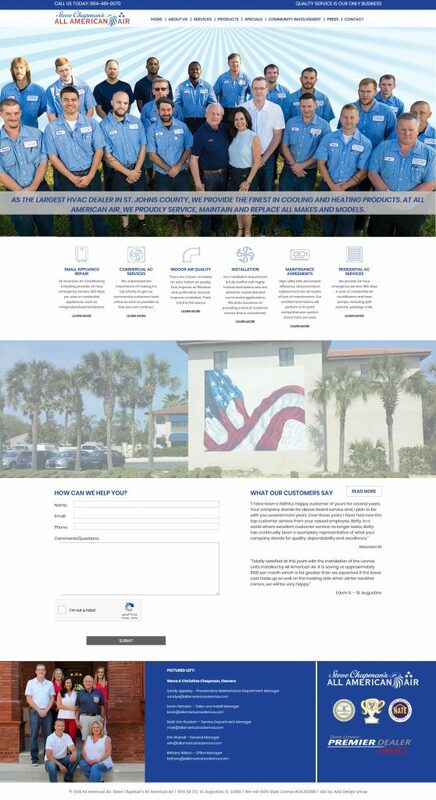 Both sites are an all new website design and development project for two of our long time clients; A to Z Roofing and Waterproofing and The Arc of the St. Johns. Each website is custom designed to the clients unique needs and programmed and developed in the WordPress platform. This provides each website with the ability to make on page changes through a Content Management System (CMS) dashboard, and also are programmed with Responsive Design, enabling each website to be mobile friendly on portable devices. 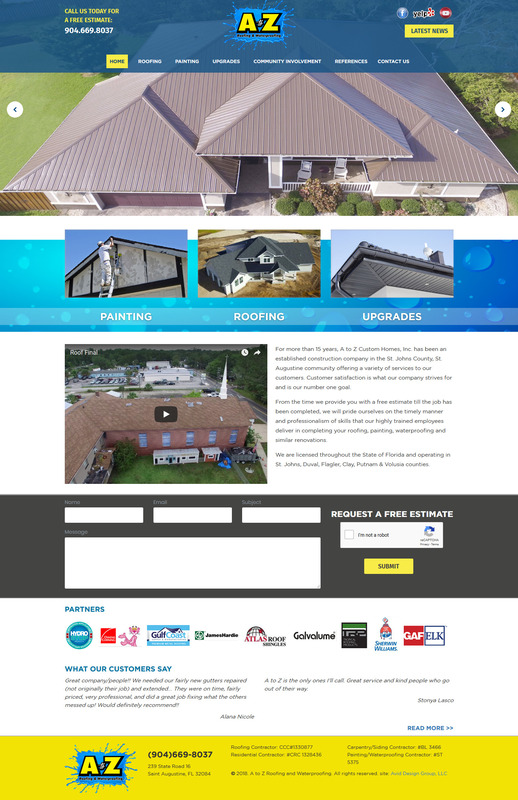 We recently completed the website design and development project for A to Z Roofing and Waterproofing. A to Z Roofing and Waterproofing is a residential and commercial construction services company located in St. Augustine, FL and operating throughout NE Florida for over 15 years. 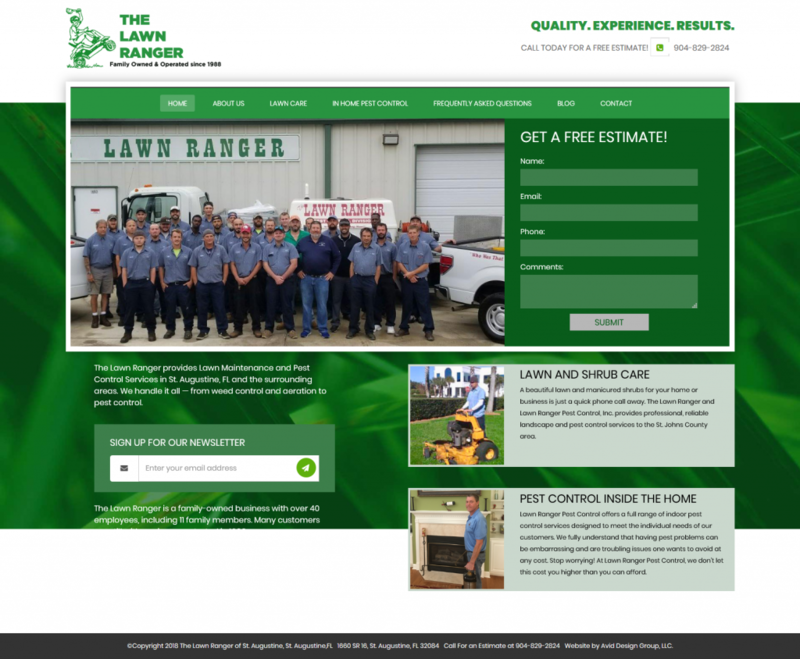 The website design project features information about their professional roofing, painting, waterproofing and similar renovations services and also provides the visitor with a wealth of information about the company and their history, professionalism and community involvement. 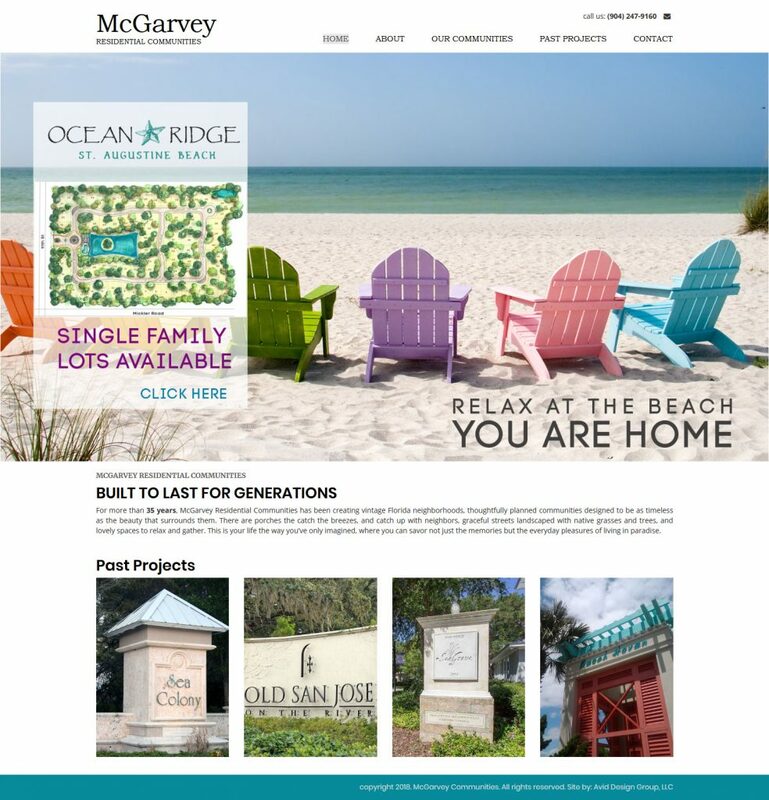 You can view the complete website design project by visiting www.AtoZRoofingAndWaterproofing.com, or by clicking HERE. 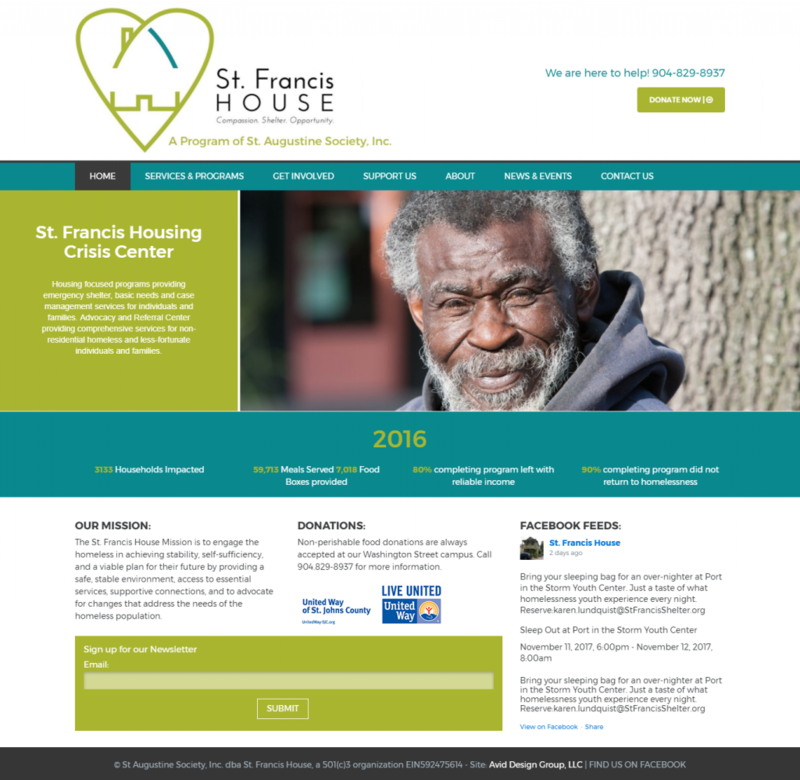 Avid Design Group has been providing website design and development services to The Arc of the St. Johns for almost 12 years. 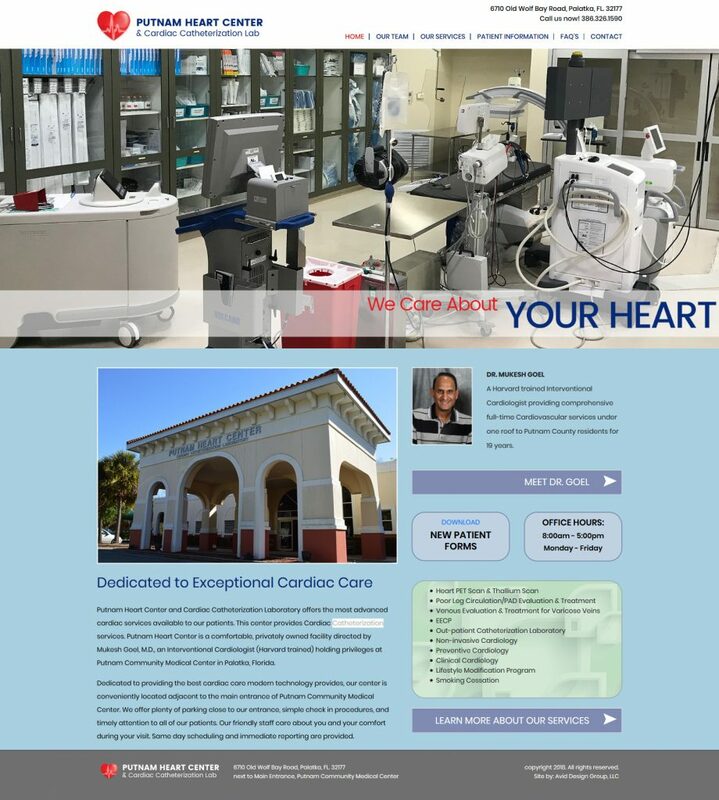 The new website design project recently completed is the 3rd generation website we have designed and developed for their organization. The Arc of the St. Johns is located in St. Augustine, FL and provides services to people with Intellectual and Developmental Disabilities (IDD) throughout St. Johns County, FL. The website is a valuable resource of information about the company and all of the types of services and activities they provide. It also serves as a valuable means of fundraising for the non-for-profit organization. 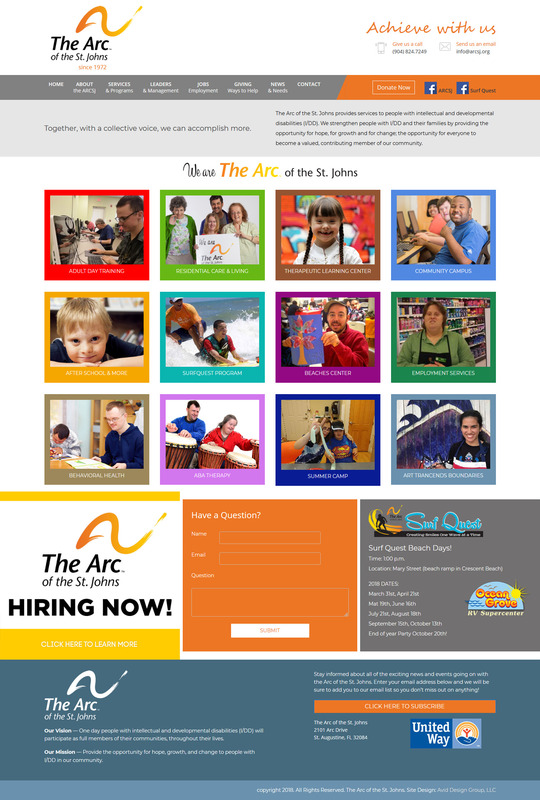 You can learn more about The Arc of the St. Johns and view their completed website design project by visiting www.ARCSJ.org or by clicking HERE. The following website home-page images are a samples of some of the exciting new projects we launched for our clients in the first half of 2018 at Avid Design Group. 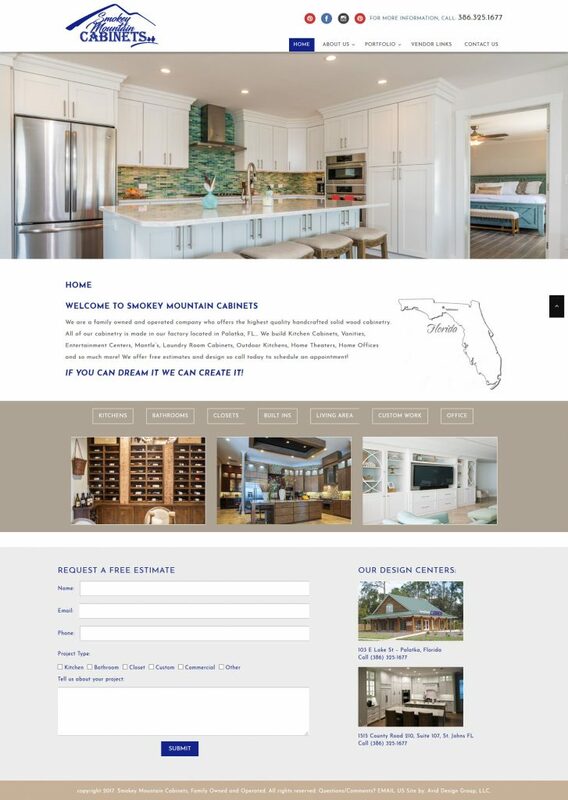 We were delighted to design these websites for our new clients Smokey Mountain Cabinets and Lawn Ranger of St. Augustine, as well as our existing clients at Integrative Pain Solutions and McGarvey Residential Communities. Each of the projects are custom designed websites to meet the clients needs and programmed in the WordPress platform. The are programmed with “Responsive Design” and contain a Content Management System (CMS) for the client to make on-page changes of content if necessary. 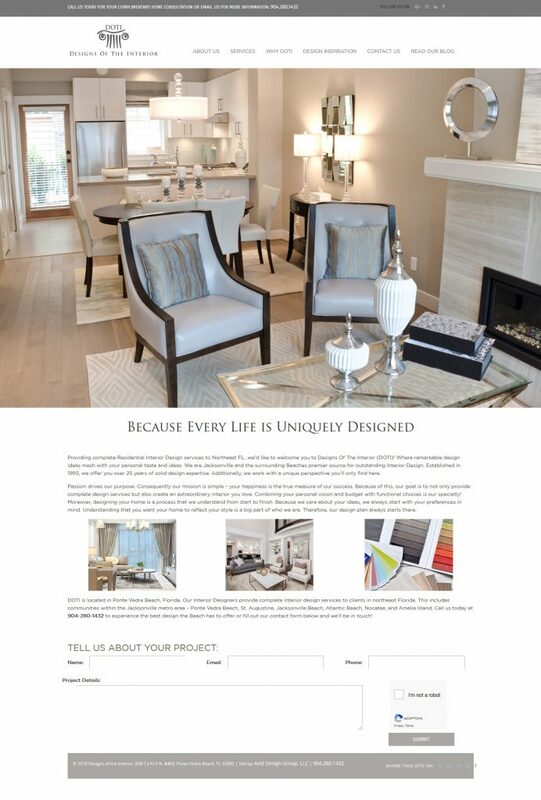 Please click HERE to view our complete on-line portfolio of completed website projects. Here at Avid Design Group, we have had the opportunity to work with a lot of great businesses and attractions in our area. But none that can reinvigorate your younger years like The Fountain of Youth Archeological Park located in beautiful historic St. Augustine, Florida. 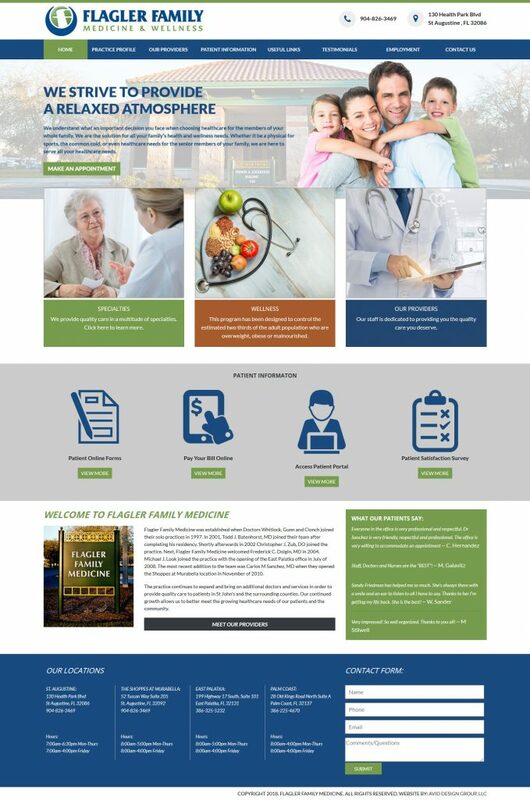 We were recently selected by the Park to provide them with a custom designed website that visually enhanced the character and theme of the Park while visiting the website. There is also a wealth of information available on the site to learn about the history, available exhibits, event venues, educational programs of the Park and much more. The website is custom designed with strict adherence to the visual vision of the Fountain of Youth. Programmed in WordPress, it enables the Park staff to self manage content as needed. The website is “mobile friendly” and offers an integrated 3rd party e-commerce store and ticket purchasing system. Our next phase of the site currently in production is the programming of a ticket purchase system to meet their current and expanding needs. 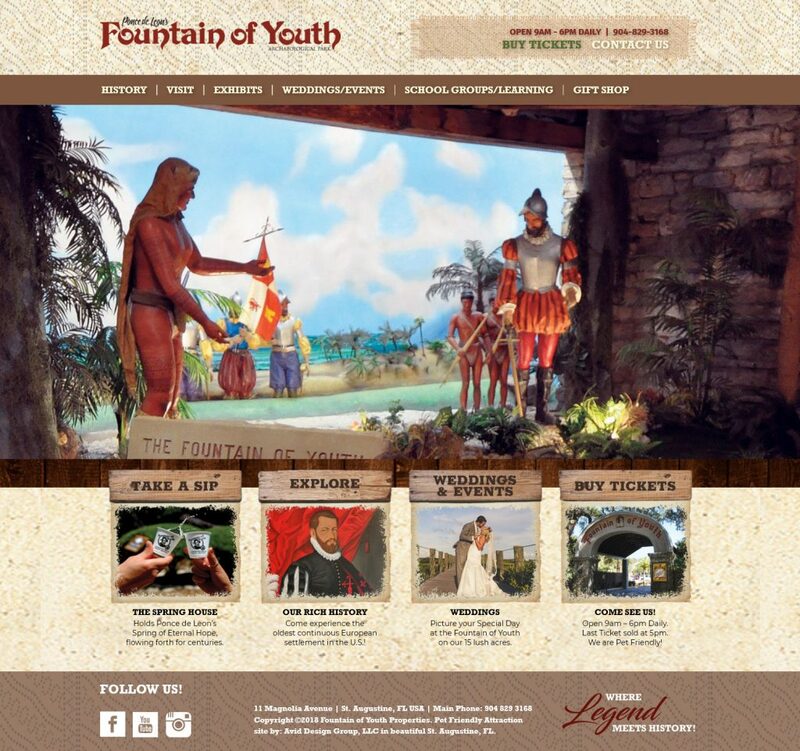 You can visit the completed website at www.FountainOfYouthFlorida.com.